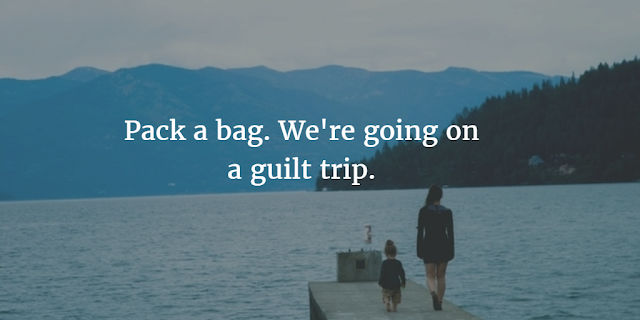 Motherhood and guilt. They seem to go hand in hand. From the first moment you realise you are pregnant and then remember that you got really pissed at that wedding two weeks ago - the guilt begins. There's a never ending ebb and flow to it, and nothing, NOTHING, is too insignificant to bring it on. You don't do crafts with them because you can't bear the mess. You didn't sign them up to after-school sports because you couldn't face yet another collection time. You go to work so are depriving them of the joys of a stay at home mum. You don't go to work so are depriving them of a strong role model. You feed them pasta every day because that's all they'll eat. And spend too much time on screens. Which you aren't properly monitoring. Because you spend too much time on screens. You went out last night. You can't afford to bring them on holiday. You spoil them too much. But you don't play with them enough. Your house is too small. On and on and on it goes, an endless cycle in your head. Each age and stage brings different triggers but it never, ever abates. Sometimes though, something big happens that puts all the other little things in perspective. And surprisingly it can change that never-ending carousel of guilt. For me it came over two years ago when I was separating from their dad, a thing so momentous for a child that as a parent you could get buried under the weight of the guilt. Everything your children do and feel and say suddenly gets referred back to that fact, so that it becomes the go-to query for all of their behaviour. Is that why they are acting up \ angry \ withdrawn \ anxious \ tearful? Cue guilt-fest. Of course you could beat yourself up with it forever if you wanted to, but a wise friend told me right at the start of my journey not to bother. She impressed upon me that as long as children have unconditional love and are supported and hugged and smothered in that love, then they will be fine. 20 minutes looking into each others eyes trying to come up with something bigger than all the grains of sand on every beach in the universe to explain how much you love each other - then you realise that they will be ok. Because you know you love them. And they know you love them. And nothing else is really that important after all.